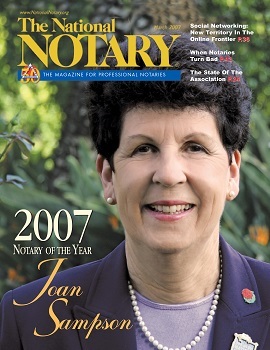 While nominations for the 2015 Notary of the Year continue, we take a look back at 2007’s award recipient, Joan Sampson of Sheridan, California. When it comes to notarial professionalism, Joan Sampson does more than just talk about it. She lives it. 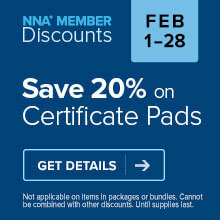 For the past 30 years, she has been fiercely dedicated to preserving the integrity of the Notary office. She’s the notarial expert at her job with a real estate development company. She’s also a Certified Notary Signing Agent and runs three separate action groups to educate fellow Notaries and promote the professional responsibility that comes with the commission. But there is much more to Sampson than being a professional Notary. The Sheridan, California, resident volunteers to help send hundreds of care packages to U.S. soldiers in Afghanistan and Iraq. She uses her time away from work to make quilts that, through her church group, are donated to the needy. Sampson is a loving wife, mother and grandmother, and emphasizes that family always comes first. Because of her dedication to professionalism, her benevolence to her community and to the less fortunate, her strict adherence to ethics and her sense of obligation to mentor fellow Notaries, Joan Sampson has been named the National Notary Association’s 2007 Notary of the Year. Her resolve comes from personal experience and ever-present observation. “Professionalism is suffering very badly in the workplace, along with ethics. I think it’s difficult for anyone who is a Notary because they’re constantly being challenged to maintain their integrity,” Sampson said. Her first major challenge on that front arose in 1984 when her moral foundation came under attack by an employer. She was working in the real estate field and was tasked with notarizing a variety of documents. One day, her boss ordered her to notarize an incomplete deed. She refused. Her boss balked at this “insubordination” and demanded that she perform the notarization. Sampson called the NNA Hotline and confirmed she was doing the right thing. Her boss yelled. Her boss didn’t fire her that day, but she lost her job of five years shortly after — a hefty price to pay for maintaining her principles. She kept her head high and forged ahead in her career, always keeping the experience fresh in her mind. “When I interview for a job, I always tell my bosses that I will do anything as long as it’s not immoral or illegal,” she said. To that end, Sampson has earned the utmost respect. “Joan is by far the most honest person I’ve ever known, next to my mom,” said Jeff Pemstein, Sampson’s current supervisor of two and a half years at Towne Development of Sacramento, Inc. Even a quick glance at Sampson’s day-to-day routine gives the impression that she functions at a pace that would leave two people exhausted. She works full time at Towne Development, where she assists Pemstein and manages the office. She also performs between 300 and 500 real estate-related notarizations for the company each year — in addition to her assignments as a Notary Signing Agent. As if that weren’t enough, she and her husband of 45 years, Lee, decided in 2000 to build a new home on a multi-acre tract outside of town — with their own hands. Such dedication has been the nature of Sampson’s life with her husband and her family, which is firmly rooted in closeness and teamwork. Sampson and her husband met on a blind date when she was 16, and they remain such close friends and partners that he accompanies her to all the NNA Conferences she attends — 11 and counting. They have three sons — John, 43; Jeff, 41; and Joel, 36; all engineers — and six young grandchildren to dote on. But quilting is more than a hobby. It’s another way Sampson gives back to her community. The church group gives the quilts they make to the needy, such as the women and children of Acres of Hope, a homeless shelter. As a child, Sampson learned about the importance of altruism from the examples set by her grandmother, who taught Sunday school, and her mother, who volunteered for a variety of activities in their community. Of course, that desire to help others spills over into her role as an NNA Notary Ambassador® — a position she uses to educate her fellow Notaries and help them deal with the same kind of issues she has faced in her career. Sampson leads three separate monthly Notary action group meetings, all free of charge, in the Sacramento area — each attended by about 30 Notaries — as a local resource for education and support. She prepares for the meetings by having a discussion topic, a quiz, handouts and updates ready for her attendees. Group member Cheryl Palazinni said the discussions and brainstorming sessions have raised her understanding of how to handle issues that may come up during signings and notarizations. “Joan has been very proactive in leading our group. She is tireless in her efforts to help myself and others become more mindful of our duty to the public as a Notary,” said Palazinni. The groups meet to also discuss the aspects of new Notary laws. Keeping up with state statutes is not only a Notary’s ministerial and legal responsibility, but also a moral duty, Sampson said. She has a simple litmus test for herself and for other Notaries to help gauge gray areas when asked to perform notarizations. “If you think it’s wrong, it probably is, and you shouldn’t do it,” said Sampson. Irene Haas, who met Sampson in grade school and grew up with her, said Sampson is steadfast and completes any task she puts her mind to. Sampson also never tires of adding to her wealth of notarial knowledge by continuing her own education and training. When she was hired by Pemstein in 2004, she let him know she’d need to take a few days off almost immediately to attend the NNA Conference in Philadelphia. She went with his support. Sampson’s ethics, character and attention to detail were shaped in part by her parents. Born in San Mateo, California, Sampson explained that her mother had high expectations for the family and was uncompromising about that. Sampson’s father was a stickler for punctuality, and that’s a trait she carries with her today. She is uncompromising in making sure she fills out her journal entry and obtains the client’s signature and thumbprint, if necessary. And she won’t be resting on her laurels. Thank you NNA for the highest honor I've ever received and for re-visiting what was a very special moment in my life. Would like to know 2015 dates for Joan Sampson's Notary Action Group Meetings in Sacramento, CA. Hello! If you can please email us your contact information at social@nationalnotary.org, we'll be happy to pass on your message to Joan.